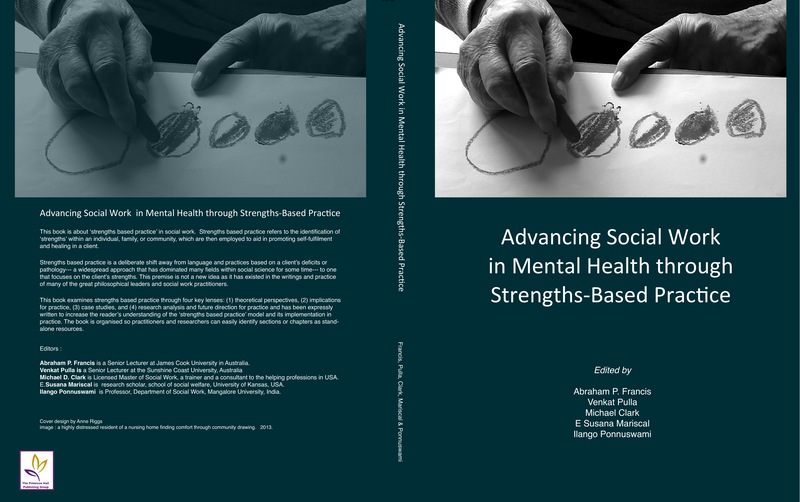 The book Advancing Social Work in Mental Health Through Strengths Based Practice was formerly launched on Friday 11 June 2014 at the International Social Work Conference, Melbourne. I had the honour of being invited to design the cover. Its editors (Abraham Francis, Venkat Pulla, Michael Clark, E Susana Mariscal and Ilango Ponnuswami) and chapter contributors are practitioners and academics working across a broad range of mental health fields in a wide range of situations and countries. The image was taken from a video I took in a nursing home where a relative lives. She has vascular dementia, which has led to aphasia (inability to speak) and her condition has now progressed so far she cannot do anything at all for herself. She does, however, recognise her two companions, her favourite nurses and us, but she cannot focus on anything for long; she smiles and sometimes responds to the goings-on around her. It is a long and drawn out end to her life – but unlike some others at the home, she rarely appears distressed. Mental health issues in the extremely old are largely overlooked, especially when that old person is suffering from chronic illness and dementia. Nursing homes attend to their physical needs but societally we don’t respond very well to their emotional needs. Yet this cohort are experiencing some of the most profound changes in their lives and many are forced to face these changes alone, without their life-long partners and friends, and sometimes even their children to support and guide them. Those who once were able to ‘roll with the punches’ find even the smallest change unsettling and disorienting; they frequently experience high levels of stress, anxiety, depression and feelings of grief and loss. These are all common responses to significant life changes, regardless of age, and are the reasons many people seek support from psychologists and counsellors, but older people rarely seek or are offered these support services. Anxiety is common amongst the elderly. They are easily overwhelmed, and dementia stops them understanding where they are, or what they are supposed to be doing. New nursing home residents are usually highly distressed, yearning to go home, wanting their partner, or looking for their car, wallet, the stairs or their mother. It is a very hard time for them and they need to be comforted and settled with kindness and reassurance. Some, like the woman in this picture, Thelma, remain in a near constant state of distress. She often cried out “God take me!” so her life could be over. Feelings of loss and grief are never far from the surface in a nursing home. I wander around and see photos of the old lives on the walls – when this frail and helpless individual was a vibrant bride, granny, adventurer or nurse. No-one could know, for example, that my relative, now un-functioning in her princess chair, won a school prize that rewarded her for her writing with a trip which would be the start of an adventurous life of travel and learning. Loss of identity and purpose, meaning and independence are amongst the many unacknowledged losses within this group of people. But the biggest losses I see and hear of, are born of loneliness: of being without the community that sustained them in the past, or arriving at this place only to find themself being untethered from children, grandchildren, friends and family, regardless of how dedicated they may have been in the past to their various roles. Thelma liked to talk and over the months she and I became friendly. With her wonderful gift of language she painted marvellous pictures of her life, and her confusion, which I thoroughly enjoyed; and in her times of distress I reflected her emotions back to her so she would know that I thought they were valid and tried to comfort her with talking, art and hand massages. Whilst some remain disoriented and distressed, many old people show incredible resilience as well as the ability to cope reasonably well with their changed circumstances. We are at that stage of life where conversations with family and friends often circle around issues of our aging parents. Loneliness is their constant visitor, and no matter how present we are, we can never fully alleviate it. But how to assist? Since the death of my father eight years ago, my mother got on a tram and attended a weekly exercise class. She is shy and loved going because the focus on exercise meant she could get to know people slowly and, at the same time, could maintain her strength, balance and independence. Her life changed for the worse when the classes stopped and there was nothing close by to replace it. She languished for months until we connected her with a yoga teacher and she now has private weekly lessons in her home. Not only does she love the teacher and the exercise, her physical and mental health has improved so much that her medical carers have noticed. Yoga practice helps maintain physical and mental wellbeing. At the nursing home I showed a few breathing techniques to a woman with dementia who is often very anxious and short of breath. She doesn’t remember her now-dead husband’s name or why she is distressed but with prompting she seems to remember the breathing techniques. The gentle interactions between us, the constant flow of the breath and the arm movements that accompany them, are able to stop the anxiety and bring her back to the here and now. When this simple practice is so effective, I feel despair knowing she is often left alone in her room when her anxiety causes distress to others and nobody at the home has the time to sit with her to practice these simple breathing exercises. It is difficult to find ways to relate to our relative as she has become increasingly unresponsive to her surroundings and us. There are now very few points of connection but the most powerful I see is beyond cognition or words. It comes from a very deep place that recognises the loving relationships that pre-date her dementia and with others, her new friends, her responses are to people who care and love her for who she is now and who do not grieve the loss of who she was in the past. 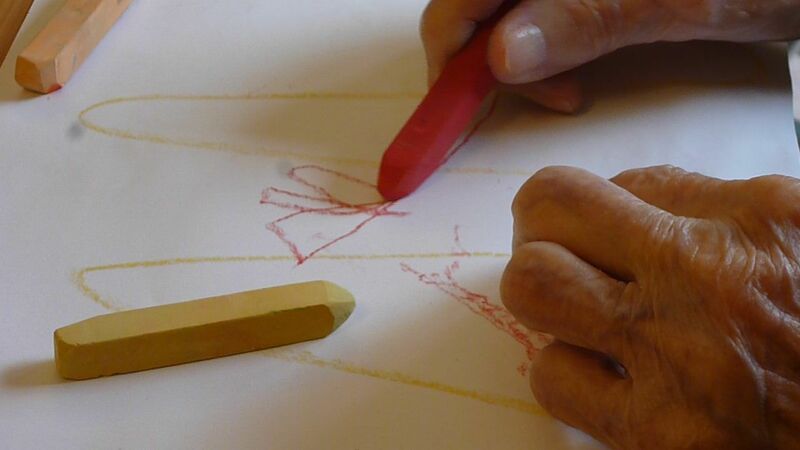 When we create community events with groups of residents, such as doing gentle exercises, art projects, singing and sitting around and chatting and she is involved, she is connected and is responsive, albeit in her own and small way. Good mental health is important for the overall wellbeing of the extremely old. As a community and as family members we need to be cognisant that even in their deepest dementia, feelings of loss, grief, anxiety and depression can be present and felt. So too, can feelings of connection, engagement and love. This sector of the community are at their most vulnerable and with some effort – and sometimes not even a huge amount of effort – we can ensure this final phase of their lives is lived without adding to the existing feelings of frailty and vulnerability. for information about purchasing this publication, email Dr Abraham Francis. Congratulations for coming out with this book. The issues are indeed very critical. In India there are probably many such cases and very few professional services available for the elderly. It is with hope that this book will promote and advocate for such services in India.